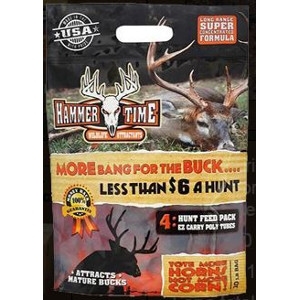 Hammertime Wildlife Attractant 5 lb. Talk about effective and EZ! Simply open the bag and pull out one of the 2.5 lb. EZ carry feeder packs of attractant and head to your deer stand. 2-hunt pack. HAMMERTIME WILDLIFE ATTRACTANT is a premium blend of several different agriculture meals, which may include but not limited to soy meal products, corn and rice meal products, natural sugar products, natural grass crop meal products, artificial sugars, both natural and artificial flavors and aromas, salt and diatomaceous earth food grade.